The topic of Earth Angels is HUGE and I could easily write 10 blog posts on it. Trying to give you a really personal feel for what I have learned from my studies on it, without just rattling off from a book. Ever since I was a kid I felt “different” and even though I always had the best of intentions at heart, many times others could not see my true intention. I was also super quiet as a kid (I was taught to be seen and not heard and always mind my elders) until I became friends with a girl in my teenage years who was VERY outspoken and encouraged me to find my voice. By watching her aggressively challenge any person she thought deserved it, I learned that many times people never had the courage to scream back at her. And sometimes the things she said literally made me cringe. Mind you, the things she was addressing were things that absolutely needed to addressed! If someone did something horrible she would call them on it. Always. I learned that there was and could be a happy medium. One where we could call someone out on their poor behaviour and do so lovingly while still getting the point across. And how wonderful that truly is to be able to bring awareness and compassion to a situation that would have either been swept under the rug or ended up in a battle royale? And, the further along an Earth Angel gets on their journey of understanding and awareness the more and more peaceful ALL situations they encounter will be addressed. Like I said earlier, having always felt like an Earth Angel yet never feeling like I fit in caused a lot of angst in my younger years. If I knew I was right for the greater good and the person I was trying to enlighten didn’t see it my way, I could get sucked into an argument. Which always made me feel even worse afterwards! So I will ask you a few questions and please, think if they are a yes or a no for you. 1. Do you feel full of hope and optimism? 2. Do you feel super sensitive? 3. Do people say you wear rose coloured glasses due to your innocent outlook on life? 4. Have people taken advantage of your kind and giving nature? 5. Have you had painful past relationships with loved ones? 6. Do you believe in fairness? 7. Do you always look for potential in others? 8. Do you want everyone to be happy? 9. Do you believe in a power greater than us? 10. Do you feel unhappy when you see others upset? 11. 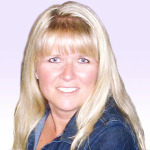 Do you feel like you are on a divine life mission and want to help others? If you answered yes to the majority of those, then you are an Earth Angel and I have no doubt that having the realization will bring you a new sense of connection and understanding, awareness and strength. 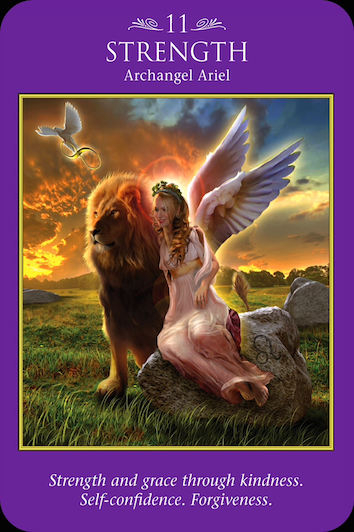 I love the card in the pic with this post because it shows an angel with a dove overhead (who is holding the infinity or #8 which stands for justice) and who has made peace with a powerful lion who stands next to her like a friend full of strength and support. If you are an Earth Angel who is still in battles with others or who is allowing others to take advantage of your kindness, please know that those 2 polar opposites are part of the growing into your new awareness and self-confidence. It is time to let it go and learn to find the happy middle. How does that sound? What has helped me GREATLY, is when I have to deal with a loved one who knows how to push my buttons, I remind myself that, every action is either “love” or a “call for love”. This helps me be more kind in my actions and in understanding where they are coming from. I would love to hear from other Earth Angels on how they have dealt with situations that have really been an eye opener for all involved while still keeping everyone’s dignity intact.